This rental is everything AND MORE!!! You will just need to pack your swimsuit and you are ready. The owners have thought of everything ~ very neat and organized. The owners were wonderful to work with and the neighborhood is amazing. You will not be sorry to renting Tides Cottage. Amy & Eric - thank you so much for your nice review. We really do try to make our cottage as self-sufficient as possible so there's nothing you need to worry about but enjoying your time at the beach! We appreciate you taking the time to share your sentiments. This was a wonderful home away from home. The beach was much closer than I anticipated which made trips to the beach with my three kids very easy. I loved being able to look out the window and see the ocean after the kids were asleep. We all had a great time and look forward to going back next year. This beach house has all the comforts of home, with bright cheery colors in every room and tastefully decorated. You will not mind spending a rainy day in this place...it was like a home away from home. You cannot beat the amenities...a flat screen TV, central AC, use of beach chairs, beach toys for kids, grill and patio table for outdoor eating and towels/sheets provided if desired. And, parking for four cars...always a plus at the beach!!! Location is great...only a short walk to the beach and ocean views from the deck and sunroom. There is a coffee shop also a short walk from beach house and across from the beach. The Carriage House, Saunders, Ronaldo's on Rt 1 are great restaurants in area. We also liked "Al's" on Rt 1 for great fried food similar to "Pete's," also a good place to eat with a view of the ocean. You have to check out "Christine's Crossing" at 1000 Washington Rd in Rye...a women's clothing store with unique and funky styles and some children's clothing too...cool place. Attached to the clothing store is an antique/home decor store with original paintings and an array of other home decor items for sale. We would absolutely recommend this lovely place...you will not be disappointed!!! 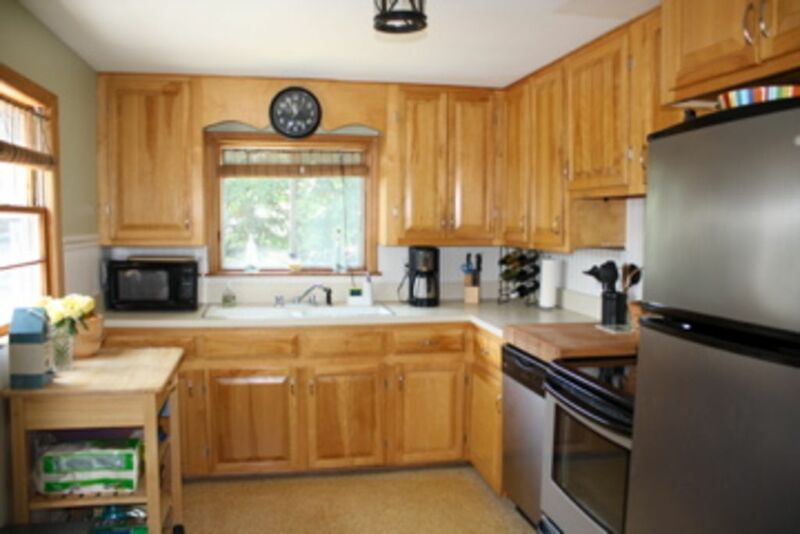 Located in a quiet neighborhood, just three houses in from the entrance to Jenness Beach. The Carriage House restuarant and Rye General Store are within walking distance for the nice dinner, or quick cup of coffee. Hop in the car for a quick trip to go bike riding at Odiorne State Park, downtown Hampton for some arcade fun, shopping in Portsmouth or bargain hunting at the Kittery outlets.